.NET は、Windows 上で実行されている多数のアプリケーションに不可欠な部分であり、それらのアプリケーションが稼働するための共通の機能を提供します。.NET is an integral part of many apps running on Windows and provides common functionality for those apps to run. .NET Framework は、視覚的に美しいユーザー エクスペリエンスと、シームレスでありながらもセキュリティで保護された通信機能を備えたアプリケーションを構築するための包括的で一貫性のあるプログラミング モデルを開発者に提供します。For developers, the .NET Framework provides a comprehensive and consistent programming model for building apps that have visually stunning user experiences and seamless and secure communication. このトピックは、独自のシステムに .NET Framework をインストールする開発者や自分のアプリケーションで .NET Framework をインストールする開発者のために作成されています。This topic is intended for developers who either want to install the .NET Framework on their own system or who want to install it with their applications. .NET Framework のインストールに関心があるユーザーは、個別トピックをご覧ください。Windows 10 と Windows Server 2016 に .NET Framework をインストールする方法など、特定のオペレーティング システムに .NET Framework をインストールする方法を紹介しています。For users interested in installing the .NET Framework, see the individual topics that discuss installing the .NET Framework on specific operating systems, such as Install the .NET Framework on Windows 10 and Windows Server 2016. この記事では、.NET Framework 4.5 から .NET Framework 4.7.2.NET Framework 4.7.2 までのすべての .NET Framework バージョンをコンピューターにインストールするためのリンクを紹介します。This article provides links for installing all versions of the .NET Framework from the .NET Framework 4.5 to the .NET Framework 4.7.2.NET Framework 4.7.2 on your computer. 開発者の場合、これらのリンクを使用して、.NET Framework をダウンロードし、アプリと共に .NET Framework を再配布することもできます。If you're a developer, you can also use these links to download and redistribute the .NET Framework with your apps. アプリと一緒に .NET Framework のバージョンを配置する方法の詳細については、「.NET Framework 配置ガイド (開発者向け)」をご覧ください。For information on deploying a version of the .NET Framework with your app, see .NET Framework deployment guide for developers. コンピューターに新しい 4.x バージョンが既にインストールされている場合は、以前の 4.x バージョンをインストールできません。If there's a later 4.x version installed on the machine already, you can't install a previous 4.x version. OS に特定の .NET Framework バージョンがプレインストールされている場合は、同じコンピューターに以前の 4.x バージョンをインストールすることはできません。If the OS comes pre-installed with a particular .NET Framework version, you can't install a previous 4.x version on the same machine. 新しいバージョンをインストールする場合は、以前のバージョンを最初にアンインストールする必要はありません。If you install a later version, you don't have to first uninstall the previous version. .NET Framework の各バージョンの詳細と、コンピューターにどのバージョンがインストールされているかを判別する方法については、「.NET Framework のバージョンおよび依存関係」と「方法:インストールされている .NET Framework バージョンを確認する」を参照してください。For more information about versions of the .NET Framework and how to determine which versions are installed on a computer, see Versions and Dependencies and How to: Determine Which .NET Framework Versions Are Installed. .NET Framework 3.5 の詳細については、「Windows 8、Windows 8.1、および Windows 10 への .NET Framework 3.5 のインストール」を参照してください。For information on the .NET Framework 3.5, see Install the .NET Framework 3.5 on Windows 10, Windows 8.1, and Windows 8. 次の表をクイック リンクとして使用し、詳細を参照してください。Use the following table for quick links, or read further for details. インストール前に .NET Framework のシステム要件を確認するには、「システム要件」を参照してください。To view the system requirements for the .NET Framework before installation, see System Requirements. トラブルシューティングの方法は、「トラブルシューティング」を参照してください。For help with troubleshooting, see Troubleshooting. 4.64.6 Visual Studio 2015 に含まれるIncluded in Visual Studio 2015. .NET Framework の特定のバージョンの Developer Pack は、利用可能な場合には、サポートされているすべてのプラットフォームにインストールできます。You can install the Developer Pack for a specific version of the .NET Framework, if one is available, on all supported platforms. (完全な一覧については、「システム要件」を参照してください)For a full list, see System Requirements. ユーザーと開発者のための .NET Framework の概要については、「.NET Framework の概要」を参照してください。For a general introduction to the .NET Framework for both users and developers, see Getting Started. アプリとの .NET Framework の配置については、「配置ガイド」を参照してください。For information about deploying the .NET Framework with your app, see the deployment guide. .NET Framework のアーキテクチャおよび主要機能の概要については、概要を参照してください。To read about the architecture and key features of the .NET Framework, see the overview. 開発者を対象としたパックをインストールして、Visual Studio や他の開発環境で .NET Framework の最新バージョンに合わせた開発を行います。または、再頒布可能な .NET Framework をダウンロードして、アプリやコントロールと一緒に配布します。Install a developer targeting pack to develop against the most recent version of the .NET Framework in Visual Studio or another development environment, or download the .NET Framework redistributable for distribution with your app or control. Targeting Pack は、Visual Studio や他の開発環境で開発するときに、アプリを .NET Framework の特定のバージョンを対象にすることができます。A targeting pack lets your app target a specific version of the .NET Framework when developing in Visual Studio and some other development environments. 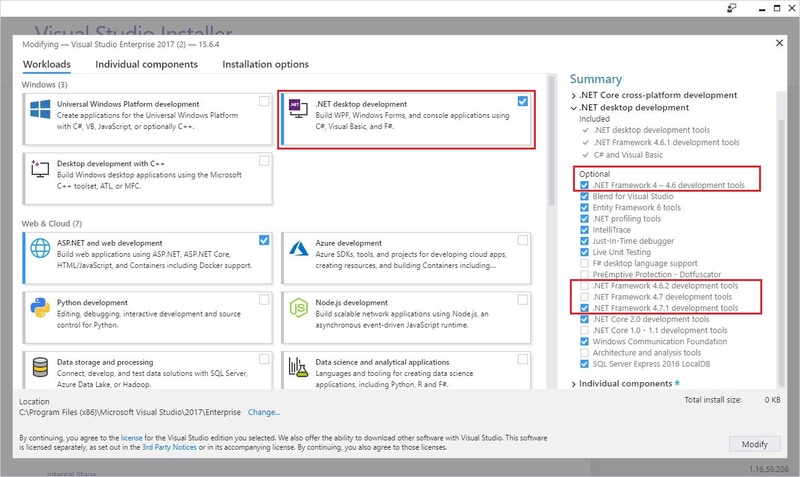 Developer Pack には、.NET Framework の特定のバージョンと、それに付随する SDK が、その対応する Targeting Pack と共に含まれます。A developer pack includes a specific version of the .NET Framework and its accompanying SDK along with its corresponding targeting pack. .NET Framework 4.5.2 Developer Pack により、Windows 8.1 以前、Visual Studio 2013、Visual Studio 2012、または他の IDE にバージョン 4.5.2 をインストールします。.NET Framework 4.5.2 Developer Pack to install version 4.5.2 on Windows 8.1 or earlier, Visual Studio 2013, Visual Studio 2012, or other IDEs. .NET Framework 4.5.1 Developer Pack により、Visual Studio 2012 または他の IDE にバージョン 4.5.1 をインストールします。.NET Framework 4.5.1 Developer Pack to install version 4.5.1 on Visual Studio 2012 or other IDEs. 開発者パックのダウンロード ページから、[ダウンロード] を選択します。From the developer pack download page, choose Download. 次に、[実行] または [保存] をクリックし、表示される指示に従います。Next choose Run or Save, and follow the instructions when prompted. .NET Framework の特定のバージョンの Developer Pack または Targeting Pack をインストールすることもできます。これを行うには、次の図に示されているように、Visual Studio インストーラーで、[.NET デスクトップ開発] ワークロードのオプションのコンポーネントから選択します。You can also install the developer pack or targeting pack for a specific version of the .NET Framework by selecting it from the optional components in the .NET desktop development workload in the Visual Studio Installer, as the following figure shows. .NET Framework の特定のバージョンを対象とする場合、アプリケーションは、そのバージョンの Developer Pack に含まれている参照アセンブリを使用してビルドされます。When you target a particular version of the .NET Framework, your application is built by using the reference assemblies that are included with that version's developer pack. 実行時に、アセンブリはグローバル アセンブリ キャッシュから解決され、参照アセンブリは使用されません。At runtime, assemblies are resolved from the Global Assembly Cache, and the reference assemblies are not used. Visual Studio から、またはコマンドラインから MSBuild を使用してアプリケーションをビルドするときに、MSBuild でエラー MSB3644 "フレームワーク "framework-version" の参照アセンブリが見つかりませんでした。" が表示される場合があります。When building an application from Visual Studio or using MSBuild from the command line, MSBuild may display error MSB3644, "The reference assemblies for framework "framework-version" were not found." エラーに対処するには、.NET Framework の該当するバージョンの Developer Pack または Targeting Pack をダウンロードします。To address the error, download the developer pack or the targeting pack for that version of the .NET Framework. インストーラーは、アプリやコントロールが対象とするバージョンの .NET Framework について、.NET Framework コンポーネントをダウンロードします。Installers download the .NET Framework components for an app or control that targets those versions of the .NET Framework. アプリまたはコントロールを実行する各コンピューターにこれらのコンポーネントをインストールする必要があります。These components must be installed on each computer where the app or control runs. これらのインストーラーは再頒布可能であるため、自分のアプリのセットアップ プログラムに含めることができます。These installers are redistributable, so you can include them in the setup program for your app. ダウンロード ページは複数の言語で提供されますが、多くのダウンロードは英語でのみ提供されます。The download page is provided in several languages, but most of the downloads are provided in English only. 追加の言語サポートについては、言語パックをインストールする必要があります。For additional language support, you must install a language pack. Web インストーラー (Web ブートストラップ) は、インストール先のコンピューターのオペレーティング システムに一致する必須コンポーネントと言語パックを Web からダウンロードします。Web installer (web bootstrapper) downloads the required components and the language pack that matches the operating system of the installation computer from the web. このパッケージはオフラインのインストーラーよりもかなり小さくなりますが、安定したインターネット接続が必要です。This package is much smaller than the offline installer but requires a consistent Internet connection. スタンドアロンの言語パックをダウンロードして、追加の言語サポートをインストールできます。You can download the standalone language packs to install additional language support. オフライン インストーラー (スタンドアロン再頒布可能) には、.NET Framework をインストールするために必要なすべてのコンポーネントが含まれますが、言語パックは含まれていません。Offline installer (standalone redistributable) contains all the required components for installing the .NET Framework but doesn't contain language packs. このダウンロードは、Web インストーラーより大きくなります。This download is larger than the web installer. オフライン インストーラーはインターネット接続を必要としません。The offline installer doesn't require an Internet connection. オフライン インストーラーを実行した後、スタンドアロンの言語パックをダウンロードして、言語サポートをインストールできます。After you run the offline installer, you can download the standalone language packs to install language support. 安定したインターネット接続に依存できない場合は、オフライン インストーラーを使用します。Use the offline installer if you can't rely on having a consistent Internet connection. Web インストーラーとオフライン インストーラーはどちらも、x86 ベースおよび x64 ベースのコンピューター用に設計されていますが (システム要件を参照)、Itanium ベースのコンピューターはサポートしていません。Both web and offline installers are designed for x86-based and x64-based computers (see system requirements), but do not support Itanium-based computers. ダウンロード ページの言語を選択します。Select the language for the download page. このオプションによって、.NET Framework のローカライズされたリソースがダウンロードされるわけではありません。これは、ダウンロード ページに表示されるテキストにのみ影響します。This option does not download the localized resources of the .NET Framework; it only affects the text displayed on the download page. メッセージが表示されたら、システムのアーキテクチャに一致するダウンロードを選択し、[次へ] を選択してください。If prompted, select the download that matches your system architecture, and then choose Next. コンピューターに .NET Framework をインストールする場合は、[実行] を選択し、画面の指示に従います。If you want to install the .NET Framework on your computer, choose Run, and then follow the prompts on your screen. 再頒布のために .NET Framework をダウンロードする場合は、[保存] を選択し、画面の指示に従います。If you want to download the .NET Framework for redistribution, choose Save, and then follow the prompts on your screen. 他の言語用のリソースをダウンロードする場合は、次のセクションの手順に従って、1 つ以上の言語パックをインストールします。If you want to download resources for additional languages, follow the instructions in the next section to install one or more language packs. インストール中に問題が発生した場合は、「トラブルシューティング」をご覧ください。If you encounter any problems during the installation, see Troubleshooting. .NET Framework 4.5.1.NET Framework 4.5.1、4.5.2、.NET Framework 4.6.NET Framework 4.6、4.6.1、4.6.2、4.7、4.7.1、4.7.2 は .NET Framework 4.5.NET Framework 4.5 のインプレース更新です。The .NET Framework 4.5.1.NET Framework 4.5.1 and 4.5.2, as well as the .NET Framework 4.6.NET Framework 4.6, 4.6.1, 4.6.2, 4.7, 4.7.1, and 4.7.2 are in-place updates to the .NET Framework 4.5.NET Framework 4.5. .NET Framework 4.5.NET Framework 4.5 とそのポイント リリース、.NET Framework 4.6.NET Framework 4.6 とそのポイント リリース、.NET Framework 4.7 とそのポイント リリースは .NET Framework 4.NET Framework 4 を置き換えます。The .NET Framework 4.5.NET Framework 4.5, its point releases, the .NET Framework 4.6.NET Framework 4.6 and its point releases, and the .NET Framework 4.7 and its point releases replace the .NET Framework 4.NET Framework 4. .NET Framework 4.NET Framework 4 がインストールされたシステムにこれらのバージョンをインストールすると、アセンブリが置換されます。When you install these versions on a system that has the .NET Framework 4.NET Framework 4 installed, the assemblies are replaced. .NET Framework 4.5.NET Framework 4.5 とそのポイント リリース、.NET Framework 4.6 とそのポイント リリース、.NET Framework 4.7 とそのポイント リリースをインストールするには、管理者資格情報が必要です。You must have administrative credentials to install the .NET Framework 4.5.NET Framework 4.5, its point releases, the .NET Framework 4.6 and its point releases, and the .NET Framework 4.7 and its point release. .NET Framework 4.5 再頒布可能パッケージは、2012 年 10 月 9 に更新されています。この更新により、Microsoft によって生成および署名されたファイルへのデジタル署名が途中で有効期限切れになるという、デジタル証明書の不適切なタイムスタンプに関連する問題が解決しました。The .NET Framework 4.5 redistributable was updated on October 9, 2012 to correct an issue related to an improper timestamp on a digital certificate, which caused the digital signature on files produced and signed by Microsoft to expire prematurely. 2012 年 8 月 16 日付けの .NET Framework 4.5 再頒布可能パッケージをインストールしていた場合は、Microsoft ダウンロード センターから最新の再頒布可能パッケージを入手して更新を行うことをお勧めします。If you previously installed the .NET Framework 4.5 redistributable package dated August 16, 2012, we recommend that you update your copy with the latest redistributable from the Microsoft Download Center. この問題について詳しくは、「マイクロソフト セキュリティ アドバイザリ (2749655)」および「サポート技術情報 2770445」をご覧ください。For more information about this issue, see Microsoft Security Advisory 2749655 and Knowledge Base article 2770445. 言語パックは、サポートされている言語用にローカライズされたリソース (翻訳されたエラー メッセージや UI テキストなど) を含む実行可能ファイルです。Language packs are executable files that contain the localized resources (such as translated error messages and UI text) for supported languages. 言語パックをインストールしない場合、.NET Framework のエラー メッセージ、その他のテキストは英語で表示されます。If you don't install a language pack, .NET Framework error messages and other text are displayed in English. Web インストーラーによって、オペレーティング システムに対応した言語パックが自動的にインストールされますが、追加の言語パックをコンピューターにダウンロードできます。Note that the web installer automatically installs the language pack that matches your operating system, but you can download additional language packs to your computer. オフライン インストーラーには言語パックは含まれていません。The offline installers don’t include any language packs. 言語パックには、アプリの実行に必要な .NET Framework コンポーネントは含まれていません。言語パックをインストールする前に、Web インストーラーまたはオフライン インストーラーを実行する必要があります。The language packs don't contain the .NET Framework components that are required to run an app, so you must run the web or offline installer before you install a language pack. 既に言語パックをインストールしてある場合は、まず言語パックをアンインストールしてから、.NET Framework をインストールし、言語パックを再インストールします。If you have already installed a language pack, uninstall it, install the .NET Framework, and then reinstall the language pack. 言語の一覧で、ダウンロードする言語を選択し、その言語でページを再び読み込まれるまで数秒待ちます。In the language list, choose the language you want to download, and wait a few seconds for the page to reload in that language. サポートしている言語の一覧を次の表に示します。The following table lists the supported languages. .NET Framework での経験がない場合は、概要を参照して、主な概念とコンポーネントの概要を確認してください。If you're new to the .NET Framework, see the overview for an introduction to key concepts and components. .NET Framework 4.5 以降のすべてのバージョンでの新機能と機能強化については、「新機能」を参照してください。For new features and improvements in the .NET Framework 4.5 and all later versions, see What's New. アプリと一緒に .NET Framework を配置する方法の詳細については、「.NET Framework 配置ガイド (開発者向け)」を参照してください。For detailed information about deploying the .NET Framework with your app, see Deployment Guide for Developers. アプリと一緒に .NET Framework を配置する場合に影響を与える変更点については、「.NET Framework 4.5 のインストール中のシステム再起動の削減」を参照してください。For changes that affect the deployment of the .NET Framework with your app, see Reducing System Restarts During .NET Framework 4.5 Installations. .NET Framework 4 から .NET Framework 4.5.NET Framework 4.5 またはそのポイント リリースのいずれかへのアプリの移行については、「移行ガイド」を参照してください。For information about migrating your app from the .NET Framework 4 to the .NET Framework 4.5.NET Framework 4.5 or one of its point releases, see the migration guide. .NET Framework のソース コードをオンラインで参照するには、「.NET Framework Reference Source」をご覧ください。See the .NET Framework Reference Source to browse through the .NET Framework source code online. この参照ソースは、GitHub から入手することもできます。The reference source is also available on GitHub. リファレンス ソースをダウンロードしてオフラインで表示したり、デバッグ中にソース (パッチや更新を含む) をステップ実行したりできます。You can download the reference source for offline viewing and step through the sources (including patches and updates) during debugging. 詳細については、ブログ記事「A new look for .NET Reference Source (.NET Reference Source の新しい外観)」を参照してください。For more information, see the blog entry A new look for .NET Reference Source.